In this instructable I will show you how to build and operate a plasma speaker based on grenadier’s design, with a couple of simplifications and interim steps for people like me who are approaching this project as newcomers to electronics. I ran into numerous problems when building this speaker, and I hope that in through this instructable I can help people from making the same costly and vexing mistakes that I did. Note that before beginning this project you should have some knowledge of how to handle high voltages. The flyback transformer can drive voltages up into the >10,000V range, and that voltage can leak to other parts of your circuit so be careful! Also as noted by Wolfbane221 in the comments, plasma arcs can ionize atmospheric oxygen gas resulting in the creation of ozone gas, which is fairly toxic. Just make sure you are working in a relatively well ventilated area and you should be ok. Fans may help, but can also interfere with your plasma arc. Be safe and happy tinkering! Component-wise this project is fairly cheap, so expect a budget of around 20-30$. However, you should collect a couple of extra parts especially for some of the more vulnerable electronic components in your setup. The most concerning parts are the MOSFET transistors and your ICs, though investing in a couple of extra capacitors doesn’t hurt either. Note that this project uses some pretty high voltages, and it is easy to wreck multiple components at the same time if you are not careful! Also, it may be easier to find scavenge a cheap flyback and some heatsinks from an old Cathode-Ray-Tube computer monitor, if any of those still exist. I will go over where they are and what they look like in the next step of this instructable. I have marked specific components that are easy to fry if you make a mistake. 1x LM7812 (This semiconductor communicates directly with your IC and your 24V power source to regulate current flowing into your flyback, so double check before you plug it in! voltage ratings, as well as the LM7812 for a LM7815 if you want to pump your supply up to 40V. I ordered the majority of my parts from digikey, but you can find most of them on eBay or other online electronics suppliers. You may have some more trouble finding a CRT, seeing as those are from way back in the 2000’s. Of course you should have access to a voltmeter and some form of a power supply (I used a regulated power supply but 12V car batteries work great too). It also helps to use a current-regulated computer power supply during initial testing, so that if you make a mistake your power supply will shut off without damaging anything. I also had access to a function generator which helped out during troubleshooting, but one is not necessary. Ah yes, the venerable CRT… Useful for space heating and dropping on home intruders, CRT displays are now extinct in all but the most primitive public libraries. However, you might be able to find one of these fossils waiting to be scrapped at a local ITS department, who will probably give it to you for free to save themselves a strenuous trip to the dumpster. Before even touching the main body of the CRT, you need to discharge the cathode. This is very important and can result in serious injury or death so be careful! Begin by placing the CRT with its screen down and removing the back panel. Just unscrew everything that looks unscrewable. Then identify the cathode, which should be underneath a large rubber cap and directly attached to the monitor itself. For my project I used an old eMac monitor where the cathode was very apparent, but it may be useful look up the CRT’s schematics first. Next, construct a grounded discharge device. I used an insulated pair of pliers connected to the ground pin on my power supply. Simply wedge the pliers into the cathode port of the CRT and wait a couple of seconds for the floating 50,000 Volts to discharge to ground. Lastly, make sure to check that your cathode has discharged using a Voltmeter. Make sure that you only touch the cathode with the voltmeter wires! We only need two components from a CRT: the flyback transformer to amplify our signal to ridiculous voltages and a couple of heatsinks to prevent said voltages from destroying our MOSFETs. The heatsinks should be readily apparent once you remove the outer casing of the CRT, and are most likely around ventilation ports. Also as you go along remember to discharge any capacitors before touching them! Just connect their ports with a screwdriver and you should be set, or follow the instructions on this convenient link: http://www.wikihow.com/Discharge-a-Capacitor. The flyback transformer might be hidden deeper within the bowels of the CRT, and should look a little like this: http://www.electronicrepairguide.com/images/flybac.... Don’t worry about being precise when ripping the flyback out, so long as you keep the cathode and the ground prongs in relatively good shape! 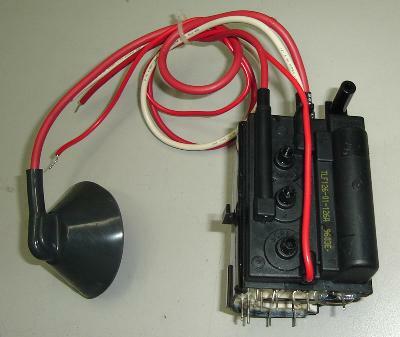 You may notice two other wires connected to the flyback – these aren’t important and can be removed. The Gate Drive Transformer is pretty simple to build, but it’s important that you get it right. The GDT is used as a transformer to drive the MOSFETs without exposing your IC to high voltages. Just wind some 22ga wire around the ferrite core 14 times, while reversing one coil so that the waveforms reaching your MOSFETs are inverted (I did this by flipping the top and bottom wires on one winding). This is important because the MOSFETs are intended to flip on and off opposite of each other in response to the signal they are receiving. If both are on at the same time current will flow between them, your circuit will overheat, and your MOSFETs may break. You can check your phasing by running an AC circuit through your GDT and checking that the waveforms are inverted. Also note that I used lacquered wire for this project. This is a little risky because lacqured wire has low insulation, and hence you can get interference between your coils. It wasn't a problem for me, but if I had some insulated 22ga wire I would have used that instead. For this instructable I used the circuit diagram provided by grenadier. I have also attached a schematic for those interested. I initially built mine on a breadboard, for which there are some simple tutorials on YouTube and WikiHow (it’s pretty straight forward). Note: while it usually isn’t an issue, “crosstalk” between adjacent rows due to high voltages can potentially cause adjacent wirings to distort one another. If you are trouble shooting and you think this is an issue, just try spreading out your components. Some simple additions to decrease the mortality rate of your circuit could be to add some current limiting resistors going into your LM7812 voltage regulator and on the out wire attached to your flyback transformer. A couple hundred ohms should give you a little more breathing room if you wired this incorrectly. You could also heatsink your voltage regulator, especially if you are using the 7815 with higher voltages (again, this is only going to give you some wiggle room to screw up without immediately melting your IC). Lastly, make sure you triple check your configuration before applying voltage! This includes checking the phase of the GDT to make sure that the input and output voltages are inverted. SG3525s are hard to find, so if you break any you will have to reorder them. Before you start trying to play music test your speaker using a 12V source. You won't get spectacular results but you should get an arc between your cathode and your flyback's ground pin. If you do not get a spark but you are still drawing current turn your circuit off immediately, as your probably shorting your LM or you Pulse-Width Modulator IC. If you aren't drawing current there is probably a mistake in your circuit, or with your GDT. See the troubleshooting guide at the end of this instructable for details. Step 8: Hooking Up an Aux Cable and Applying the Voltage! If you get an arc during your initial tests and do not experience catastrophic failure, its time to hook up some music and apply the voltage! Just make sure your aux cable is hooked up correctly (I used a stereo aux jack because it was the only one I had. Hooking up the ground prong also seemed to clear up some of the noise). Note that as grenadier has discussed, most mp3 players produce too much noise to get any meaningful sound out of your speaker. I hooked my laptop up to a friends amp which worked pretty well, but just a computer aux port should be fine. High voltages can short out your IC, so start with your volume all the way at zero and gradually increase it until you start to hear distortion. Unfortunately this marks the highest you can push your audio in before you start risk damaging your IC. For some reason my speaker needed relatively high voltages applied to the audio in port, which ended with me jacking up the voltage and blowing up my second (and last) pulse-width modulated IC before I could get a video. I'll upload a video when my parts come in later this week. If you made it this far you've probably had to deal with at least some of the things I'm going to discuss here, so hopefully this helps. I'll try to address the problems that seem to be thwarting people in the comments on grenadier's isntructable, and if you find anything wrong or have any suggestions please leave a suggestion and I'll include it! But first check your circuit for connection breaks! - First check that your power source can actually supply the amps that you need. It sounds like several people in the comments were using weak sources scavenged from computers and the like. Just use a couple of resistors and an ammeter to verify. - Check your GDT: Make sure your GDT is properly phased and there aren't any coils overlapping. It's easy, especially when your prototyping, to accidentally knock something out of alignment. This happened to me a couple of times, and I wasted a lot of time checking my MOSFETs/IC and the like. - Check the coil around your flyback, if it is wound poorly or if current is diffusing across your coil you may need to recoil it. - Check that your LM7812 isn't heating up. If it's getting extremely hot it may have shorted, and in this case all of your current is flowing straight through it and could be damaging other parts of your circuit. You can try swapping it out for another one or measure the leads with a voltmeter. something and broken your flyback, in which case you will need a new one. Hopefully this doesn't result in your chip dying. If you turn off your voltage immediately you should be fine. core. Some people in the comments tried this with yellow cores which resulted in their chips overheating. - Check your LM7812, it could be shorting and supplying too much voltage. - Make sure the input voltage from your audio jack is not too high, as stated before. I will add more tomorrow! Oh yeah of course, thanks for the reminder!